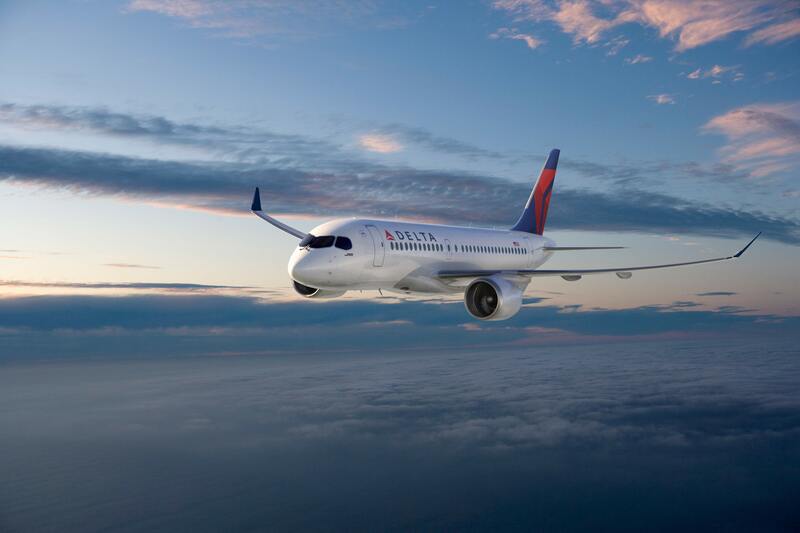 June 27, 2017, © Leeham Co.: The US International Trade Commission (ITC) last week released its detailed decision to go forward with the Boeing complaint that Bombardier engaged in price dumping when it sold the CS100 to Delta Air Lines. But for the outsider, the public document isn’t much help. It’s heavily redacted and left out all the good stuff that would allow an outsider to fully understand the reasoning the ITC voted 5-0 to send the case over to the US Commerce Department for further study and potential imposition of tariffs. Delta Air Lines Bombardier CS100. It’s clear that the investigation is not over and, for the ITC, there remain unanswered questions and further analysis to be pursued. But the crux of the ITC’s decision is that even though Boeing didn’t compete for the Delta order with its 737-700 or 737-7 MAX, the prospect that there will be competitions emerging within the next five years and the facts of the Delta deal are sufficient to conclude BBD’s price to Delta constitutes a threat to Boeing’s ability to sell the MAX in the US. The full, 140-page ITC decision may be downloaded here: Boeing BBD decision June 2017. The competition at United Airlines that preceded the Delta deal also factored in. Bombardier and Boeing competed at UAL. Boeing won, but complained it had to drop its price so low as to set a new low bar for pricing that would trickle up to the entire 737NG and MAX lines. Boeing alleged BBD sold the CS100 to Delta for $23m, or $19.6m after adjustments. Delta and BBD denied the $19.6m and said the price was “millions” higher. Testimony didn’t specifically address the $23m claim. The sales contract was provided to the ITC under confidentiality. All the pricing numbers were redacted from the decision issued last week. Every other number of interest that would have enabled an outsider to judge for himself if there was a case was also redacted. At times, the ITC went too far in redacting numbers, excluding information in the decision that survived redactions in the transcript of the hearing. At other times, the logic behind the redactions is baffling, such as deleting the number of hot-and/or-high airports that need the 737-700, MAX 7, A319 or CSeries to be serviced properly. The CS100 is particularly well-suited for challenging airports. The larger CS300 isn’t as flexible but it carries more passengers. Delta testified that the 737-700 and MAX 7 were not economically competitive with the CSeries. Furthermore, Boeing couldn’t offer the airplanes within the timeline Delta wanted. Boeing’s production lines are full to 2022 and Delta wants the airplanes beginning next year. The ITC rejected the latter argument, instead accepting Boeing’s testimony that if it had the orders, it would boost production (although it admitted it needed two years notice to do so). Delta testified to its aircraft fleet selection process. 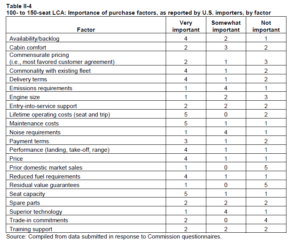 The ITC subsequently surveyed US airlines, which it did not identify, about what factors they considered and ranked by priority. The results were one of the few sets of detail that were not redacted. Availability and backlog were among the top factors. Cabin comfort (passenger experience) ranked low, something that would hardly be surprising to today’s travelers. Prior domestic sales were not important, contrary to Boeing’s assertion that Delta’s “commercial momentum” would spur CSeries sales in the US in competition with Boeing’s MAX 7. The ITC accepted Boeing’s argument that allowing Bombardier to succeed with its alleged dumping in the Delta case would threaten future campaigns, within the next five years, for the MAX 7 in the US. The ITC did not consider the realities on the ground (at least in the public documents) that within the US, the only realistic prospect of a campaign involving the 737-7 is Southwest Airlines. Southwest has hundreds of 737-700s that will have to be replaced. The likelihood of Southwest leaving Boeing for Bombardier is remote and in any event, it’s been up-gauging. The other major 737-700 operators are United, which up-gauged its 2016 -700 order to -800s and MAX 8 (and then further up-gauged some of these to MAX 10s); and Alaska Airlines, which is also up-gauging. Delta, with only 10 737-700s, operates a number of A319s from its merger with Northwest Airlines. While theoretically, replacing the A319s would be a Boeing-Airbus-Bombardier competition, Delta’s relations with Boeing (already not especially good) likely took a nosedive with this complaint. American chose the A319. JetBlue, Spirit and Frontier airlines are Airbus operators. Has Boeing sold any 737 since the UAL deal domestically? If yes, at what prices? If the prices were higher, case dismissed. And furthermore. The price drop already happened with the UAL deal according to Boeing. So the Delta deal is not important and can be ignored. Bombardier only had to sell low cos of Boeing’s price dumping in the first place. That is what I also thought immmediately: BBD should (have) brought the United deal before the ITC in first place as Boeing dumped the B737-700! The 737-700 doesn’t have the economics of the CS300, so the only way it could possibly compete, was with price. That the panel voted 5-0 in favor of Boeing’s absurd argument that the very future of the company is at stake because of the Delta sale, (while Boeing is raking in billion dollar max deals), shows how completely corrupt the system is. As the great pumpkin himself said so many times; “the system is rigged”. AFAIK, there can be no allegations of dumping against the 737 in the US market, as the 737 is manufactured in the US. A similar situation exists within Canada, as BBD can’t be accused of dumping its C Series when selling it to Air Canada. Built in Canada, sold to a Canadian customer. That’s true, but to me it sounds like Boeing is exploiting their dominant market position to squeeze out a new competitor. If Bombardier does lose this case, is there some international court they can appeal to or is this purely an American show? Does the WTO factor into this? 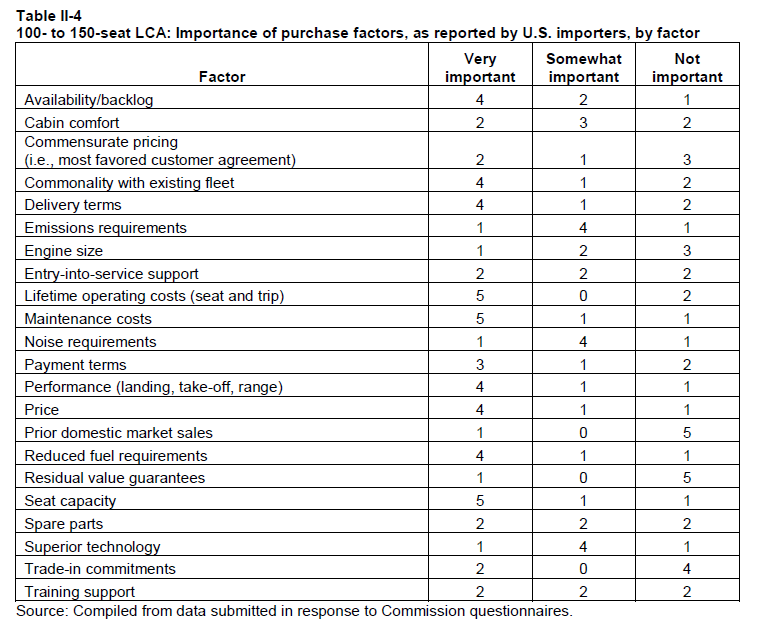 That factors priority table is quite interesting. I was surprised that 2 of the airlines did consider cabin comfort to be important. I suppose one can argue how accurate that really is in a final order consideration. The most important factors (where at least 4 airlines found it very important) are: Availability, Commonality with existing fleet, delivery terms, lifetime operating costs, maintenance costs, Performance, Price, Reduced fuel requirements and seat capacity. What didn’t seem to be too important was: Prior domestic market sales, residual value guarantees and trade in commitments. Yes there was some interesting aspect. I would think price would be lower and support and previous experience higher along with spare parts! A $3 flying beats a 1$ all to stuffing’s. What remains to be seen is what happens when and if countervailing tariffs are set by the US Commerce Department. All observers seem to assume that Delta will cancel its order for C Series aircraft. When Delta chose the C Series, it said that there was an aspect of the decision that is strategic: Delta wants to foster the emergence of a third mainline narrow body manufacturer. Surely, the Boeing complaint is one more proof that the A & B duopoly wants to remain a duopoly. Previously, Airbus has also undercut BBD by selling the A320 at prices below the C Series to carriers that were leaning towards Bombardier. What will Delta and Bombardier do if tariffs are set? Depending on the rate of these tariffs, their reaction might not be what is expected. Let’s also keep in mind the Canadian government’s recent decision to put on ice its discussions with Boeing regarding Canada’s next fighter. The Dassault Rafale would certainly be more than adequate, and Dassault has reportedly offered Canadian assembly. Which Canadian company could take charge of that? A while ago Boeing was desperate for F-18 orders, now they don’t care. The French have been aggressively pushing the Rafale for quite some time now with very limited success.I would be surprised if Canada goes for it. When all is said and done they will return to their original order of F-35s. Who says they have to import the aircraft or even take ownership on delivery. My guess is if tariffs are placed on the purchase deal Delta would simply do a sale-leaseback, hell they can easily setup an Irish aircraft leasing firm to take over the purchase, realize some tax and export breaks to lease to mainline Delta. In any case, there are ways of getting around this. Or maybe they´ll think of something duties on else, cars, Iowa pork or whatever. “The competition at United Airlines that preceded the Delta deal also factored in. 1. Aren’t proposals for the acquisition of aircraft supposed to be confidential? Assuming this to be the case, how would Boeing have known that it had to drop its price so low? 2. If campaigns for one order affect campaigns for future orders to such an extent, why would Boeing have set that precedent just to win an order from United? Surely the long-run cost in terms of lost profit would far exceed the gain from the one sale. Unless of course their true objective were to prevent the entry of a third competitor into the narrow body field. Seems to me that Boeing was doing what airlines are known to do when a new entrant tries to start up a competing route – predatory pricing until you drive you weaker competitor out of business. But under trade rules as long as you do that within your domestic market, it is perfectly legal to do so. What sort of discount did Boeing offer to Air Canada to obtain the 2014 order for 737 MAX replacing all A320’s ? Obviously it must have been significant and the Canadian side knows the answer. Their trump card ? What did Boeing off AC for the 787 early orders and the 777s? A better question would be what did Air Canada pay for their CSeries? If equivalent to the price that Delta paid then this complaint by Boeing evaporates since “dumping” by definition involves selling aircraft for less than the home market. I suspect that Bombardier offered Air Canada very aggressive discounts considering the importance of securing an order from the flag carrier of Canada. IIRC however some of the sweetener in the deal with Air Canada involved Transport Canada allowing Air Canada to offshore aircraft maintenance. Not sure how or even if this could be factored into the final sales price to Air Canada to derive an equivalent sales price to Delta. Today, European Trade Commissioner inflicted Google a record fine for hindering competition and harming society for not offering her free access to innovation. That is the way forward for Bombardier. There is no other type of market than airplane manufacturing where there is a duopoly. In all other cases, governments have intervened to bring competition into play. Just a thought but couldn’t the Canadian government find out what AC paid for the 787’s and just find one US buyer that paid more and you have Boeing dumping 787’s in Canada. I don’t think it would make a difference because there is no aircraft manufactured in Canada that is the equivalent to the 787. What would be interesting to know is what did Westjet pay for the Max 7’s they have on order? I would bet far less than what Delta paid for the CS-100. Ironically Westjet is the second largest customer of the Max 7 after Southwest and the next (and only other) customer is a Canadian startup! Almost half the orders for the Max 7 have come from Canada and yet Boeing is hell bent on destroying a Canadian competitor. The best challange for the 787 will come from Airbus as Boeing dumping of 787s across the globe has cost Airbus 10’s of billions in profits. They could have sold FAR more A330s at a much higher profit margin if it were not for Boeing dumping their 787s at 84m less then cost to build with the help of massive govt subsidies.